Anyway, as before, I have compiled these binaries using Vistual C++ 2008 (VC9) and I have provided “no-ssl” installers like Apache.org. I have tested the 64 bit binaries with Windows 7 and 32 bit binaries with Windows XP. Tags: 32 bit, 64bit, apache, apache http server, binary, installer, msi, windows msi installer, x64, x86. Update: ModSecurity 2.5.11 is now available. Now that I am using 64 bit version of the Apache HTTP Server, I also have to use 64 bit version of ModSecurity. I couldn’t find a 64 bit binary of the latest version (2.5.9 at the time of this writing), so I decided to compile it myself. Anyway, I am posting this binary here for anyone else who needs it. I am currently using it with Apache 2.2.13 in Windows 7. It was compiled with Visual C++ 2008 (VC9), with libxml2-2.7.3 and lua-5.1.4. Tags: 64 bit, binary, mod_security, modsecurity, Windows, x64. Update: Installers for Apache HTTP Server 2.2.14 can be found here. I haven’t posted anything in my blog for quite some time. It’s been more than half a year actually. 😮 Anyway, it’s about time for me to post something new. I will start by posting MSI installers for Apache HTTP Server 2.2.13. Why did I decide to create these installers? Well, now that Windows 7 has been released to manufacturing, I have started using Windows 7 64 bit. I was using 32 bit version of Windows 7 RC earlier and before that it was 32 bit Windows Vista. I had Apache, MySQL and PHP installed on my previous Windows installations, and now that I was using a 64 bit operating system, I wanted to install 64 bit versions of Apache, MySQL and PHP. MySQL.com has already been providing 64 bit binaries for Windows and I also found 64 bit binaries for PHP 5.3 here (although they aren’t meant for production use). But there is still no 64 bit version of Apache available from the official site. I did find unofficial 64 bit binaries at http://www.blackdot.be/?inc=apache/binaries, but in a zip file; without an installer. So I decided to compile Apache myself and also create an installer for the compiled binaries. An installer makes it easier to install the software at any location of your choice, and also allows you to install only the components that you need. It took me a while to set up the build environment on my new installation of Windows (Visual Studio 2008, Windows SDK 6.1, etc). While I was compiling Apache, I remembered that the official 32 bit binaries are compiled using VC6 and since I already had the build environment set up, I decided to compile 32 bit binaries too. These binaries that have been compiled with Visual C++ 2008 (VC9) should have “improvements in performance and stability” compared to the official Apache.org binaries. Tags: 32 bit, 64 bit, apache, apache http server, binaries, binary, http, httpd, installer, msi, window msi installer, Windows, x64, x86. Windows Vista: Games Explorer takes too long to load? 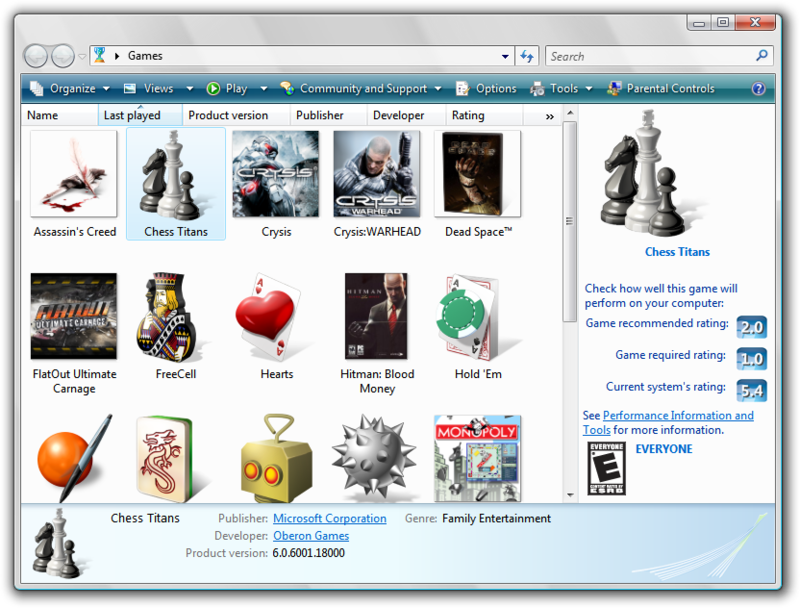 Sometimes in Windows Vista, Games Explorer may take too long to load. This can happen when your Windows Experience Index needs to be updated. This in turn can happen if you added some new hardware to your PC or because you may have reinstalled or updated some of your hardware drivers. Today, again when I tried opening Games Explorer, it took a long time to load. And I noticed that the Experience Index was again grey. So I clicked on the Update my score link on the ‘Perfomance Information and Tools’ window, to refresh my Windows Experience Index, and after that Games Explorer started behaving normally again. 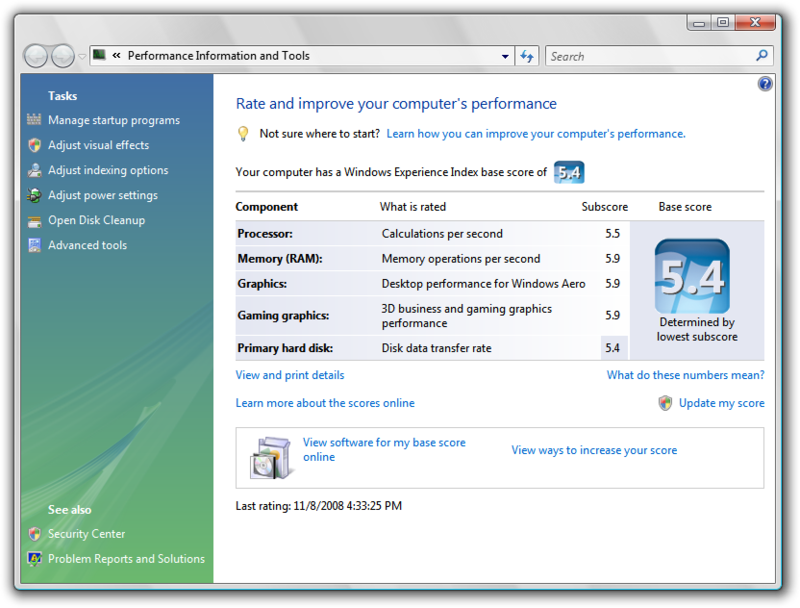 Tags: experience index, games explorer, solution, vista, windows vista. A new version of ClamAV was released recently. Version 0.94.1 at the time of this writing. cPanel however is going to take some time to release the update. In the meantime you will keep getting messages like the following in your logwatch emails or when you try to manually update the clamav databases by using the ‘freshclam’ command. If you are like me and like to keep your server software up to date, there is a simple way to upgrade to the latest version of ClamAV manually, on a cPanel powered server. First, login to your server using SSH. Then use the following commands. Now, open the file ‘install’. This file is located in the current directory, that is clamavconnector-Linux-i686 or clamavconnector-Linux-x86_64 depending on your OS architecture. The values in those lines will depend upon the version of your ClamAV. Save the ‘install’ file after making the changes. Then edit the file ‘progversion’ and put the latest version of ClamAV there. You can do this with a simple command. Finally, run the install script with the command ‘./install’. And thats it. Your ClamAV should now get upgraded to the latest version. After the installation is complete, remember to make sure that both ClamAV and the mail server are working fine. In case anything goes wrong, you can always uninstall and reinstall ClamAV. Tags: clamav, cpanel, howto, latest, Linux, tutorial, upgrade.